‘Sweetgrass,’’ a meditative and intensely beautiful documentary about the last sheep run in Big Timber, Mont., isn’t just about the passing of a way of life. It’s about the death of a particular sense of time: slow, profoundly observant, in tune with the larger cycles of nature. The movie begins with a single sheep in close-up and by the end holds the curve of the entire planet in its serenely uninflected lens. If you’re used to the ADD pace of modern filmmaking, “Sweetgrass’’ will probably drive you crazy. If you can adjust, it could widen your soul. Married filmmakers Ilisa Barbash and Lucien Castaing-Taylor were living in Boulder, Colo., in 2001 when they drove up into the Absaroka-Beartooth mountain range to document one of the Allested ranch’s final drives. (The couple has since relocated to Boston, where they work and teach at Harvard.) The Allesteds, a Norwegian-American family that has had a permit to graze their stock on federal land for generations, were winding down their operations, one more independent ranching clan pushed out by modern Big Agro. 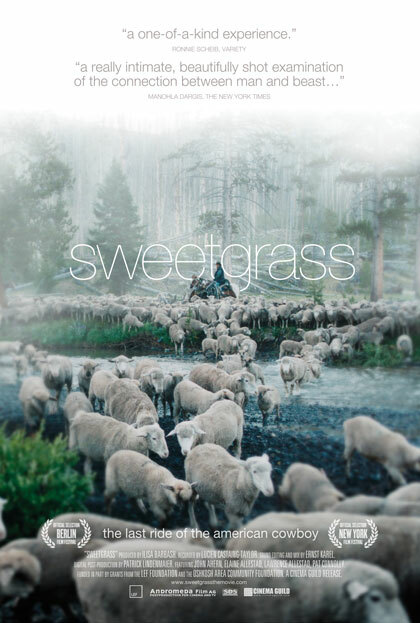 “Sweetgrass’’ unfolds without the benefit of voice-over narration, soundtrack music, or explanatory title cards — we have to find our way along with the sheep. Human beings take their time appearing and at first are negligible figures in the landscape. Eventually we duck inside for a shearing — the swoop of the electric scissors innate from decades of work — and watch one of the Allesteds casually dump a newborn lamb in a stall, the better to lure its bleating mother away from the flock. An intimate connection between man and animal is all the more evident for being unspoken. The din of man’s work (machines, radios) contrasts with the hush of the surrounding mountains, and when “Sweetgrass’’ follows two of the Allesteds’s hired men, John Ahern and Pat Connolly, up into the high country for the long summer months of grazing, the movie takes on a majestic sense of drama. The filmmakers favor distant shots that watch the river of sheep flow up the slopes, attended by tiny men on horseback and tinier dogs rushing back and forth. Their images convey both eternity and impermanence: The weight of American history and a larger geological record on which we haven’t made a scratch. In its second half, “Sweetgrass’’ settles in to observe the summer work. It’s hard, lonely, and for the young and impatient Connolly, increasingly frustrating. In one amusing scene, he cusses out the sheep not in the language of a cowboy but of an angry modern kid; in another, he calls his mom on his cell to whine about how miserable he is. By contrast, the weathered Ahern sits and says nothing, either a lot going through his mind or nothing at all. He’s this movie’s Zen sage, completely in sync with the season’s infinitely slow clock. Connolly fails as a rancher because he simply has the wrong sense of time. There’s a brilliantly eerie nighttime sequence in which a grizzly bear approaches the flock; Ahern turns on his high-powered flashlight and picks out the glow of the animal’s retinas far across the valley floor, much too near the massed lights of the sheep’s eyes. Nature heedlessly happens in “Sweetgrass’’ whether we witness it or not; a staggering image of the ranchers’ dogs picking at a sheep carcass serves as a reminder of how close we live to savagery and how easily we can slide back. They’re only reminders, though. The grazing ends and the men come down out of the mountains, Connolly singing like a kid on the last day of school. Someone asks Ahern what he’s going to do now and he gruffly responds, “I’m not gonna worry about it for a week or two.’’ Then he leads his flock down the road into the past. TY BURR. April 2 2010. Boston Globe.